Gaining vocabulary is obviously an essential part of a learning a language. There are several important parts of this learning process, I think, including having visual support for the word meaning, seeing it used in context, hearing it spoken and, ideally, having the learner speak it and get feedback on the pronunciation (either by a listener or by having the learner hear him/herself via a recording). Of course, there are tons of other reading, writing, speaking, and listening activities that are not explicitly designed for learning vocabulary, but that ends up being one of their major results anyway. I thought it would be useful for my students and readers of this blog if I developed a “The Best…” list highlighting web tools that include some or all of the important elements of vocabulary learning that I mentioned at the beginning of this post. However, I do want to make one important point about the sites on this list, and I’m not sure if I can do it clearly. This “The Best…” list is sort of a companion to The Best Reference Websites For English Language Learners — 2008. That list, one of my personal favorites, includes (among other things) my choices for the best translation sites, dictionaries, and places to learn antonyms and synonyms. Another requirement I had for a site to be on this list was that registration was not required — all someone has to do is go the site and start learning. Also, because the apps on this list all are pretty different, it was hard for me to rank them, as I usually do on this types of lists. So I’ve chosen to not list them in any order of preference. The same day Education Week Teacher published Part Two in my series there on teaching vocabulary, the British Council published my column titled Five strategies for ELL vocabulary instruction. Word Ahead is one of the best vocabulary-learning sites I’ve seen for advanced English Language Learners and mainstream students. It uses SAT words, and shows the word and representative image, plus provides audio support for text showing the word being used in context. Starfall is the established site that is rivaled by no other in providing accessible literacy activities to Beginning English Language Learners. U.S.A Learns is an incredible website to help users learn English that’s on several of my other “The Best…” lists. Even though it’s primarily designed for older learners, it seems very accessible to all but the very youngest ELL’s. It’s free to use. Students can register if they want to save their work and evaluate their progress, but it’s not required. One of its great features is that learners can report and record words that they’re learning and listen to how they sound. Learning Chocolate is designed for English Language Learners to gain basic vocabulary through many interactive exercises. I’ve previously written about the interactives created by teacher Mrs. Haquet from Frenchfrog’s Little English Pond. I just realized, however, that I have not included her extraordinary creations in this list. All of her great vocabulary games can be found here. Her interactive books can be found here. English Central is, in my mind at least, clearly the most useful site for English Language Learners that’s on the Web. It’s on a zillion of “The Best…” lists, usually ranked number one. It was really difficult to believe that they could get any better. But they just did. Thanks to David Deubelbeiss, I learned they’ve added a whole new vocabulary building component to the site. My students use the site twice each week, but I hadn’t noticed the addition. Learn English Teens also has some good vocabulary activities. Vocabulary Exercises contains a lot of thematic interactives on….vocabulary. Strategies in vocabulary learning is from Language Moments. 10 Principles for Effective Vocabulary Instruction is a really nice infographic from Eye On Education. 15+ different Vocabulary Methods (How to teach words) is from Carissa Peck. The British Council has many ideas for teaching vocabulary. my favourite ways of revisiting vocabulary is from Teaching English Notes. TESOL 2014 HIGHLIGHTS: Vocabulary Learning and Instruction is from English With Jennifer. 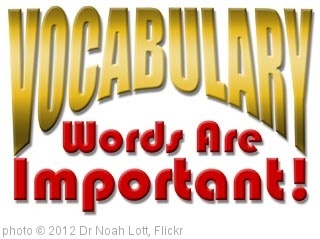 12 Ways to Learn Vocabulary With The New York Times is a nice collection. Narrowing the Language Gap: The Case for Explicit Vocabulary Instruction is from Scholastic. Adults, Peers Play Different Roles in ELLs’ School Readiness, Study Finds an Ed Week report on a very interesting study. Teaching Vocabulary in Word-Rich Classrooms is from Middleweb and offers some good instructional ideas. Rachael Roberts – Learning vocabulary through reading appeared in Teaching English. The British Council has a great collection of online vocabulary exercises. Vocabulary Strategies in 15 Minutes! is a useful post. Vocabulary Review Activity for Teenagers is from Lizzie Pinard. Test Your Vocab is an online tool where learners can get a rough estimate of how many words they know in English. I think it could be a useful tool for students to periodically use to measure their progress and get re-energized when they see how much they’re making. Great reading strategies: ‘Word Maps’ for dealing with important vocabulary is by Adam Simpson. ROOT MAP: A Vocabulary Instruction Model is from Literacy SENse. Giving Students a Well-Deserved Break- 13 Addictive Word Games is from Blog de Cristina. 3 great strategies for pre-teaching vocabulary in reading lessons is from Adam Simpson. Re-envisioning Vocabulary Instruction is by Sonja Cherry-Paul. Selecting Vocabulary Words to Teach English Language Learners is from Colorin Colorado. How Many Repetitions Do You Need In Order To Learn A New Word? Vocabulary building and revision tools is from Adam Simpson. 10 Ideas for Vocabulary Instruction in Math is from Corwin Connect. Here’s a nice lesson on using emojis to teach vocabulary. Nine ways to revise English vocabulary using slips of paper is from The British Council. 10 commonly made mistakes in vocabulary instruction is from The Language Gym. L2 Vocabulary Research and Instructional Practices: Where Are the Gaps? is a very useful article from TESL-EJ. A Systematic Review of the Research on Vocabulary Instruction That Impacts Text Comprehension is from The International Literacy Association. It’s behind a paywall, but looks like it might be worth the money. Bringing “Sophistication” to Vocabulary Instruction is by Russ Walsh. The British Council has a nice collection of Word Games. How do we help students record new vocabulary? #ELTchat summary 05/10/2016 is from…ELTchat. Here’s the Memory Trick That Science Says Works is from TIME. Five simple games for teaching vocabulary is by Mike Astbury. Brain-Friendly Strategies for Your Vocab Toolbox is from Middleweb. Ana Cristina wrote a post about an intriguing site called Word Booster. Paste in the url address of any online article and it will immediately provide you with several free PDFs of the article that has been displayed in a reader-friendly way, a word list, and a vocabulary test. I’m generally skeptical of sites that automatically create learner materials. I’ve got to say, though, that my experiments with Word Booster have resulted in some decent sheets. I still wouldn’t generally use them in my lessons. However, I think I will try it out next year by having students pick any article of their choice online and create their own sheets to complete. It might be interesting to see how it goes. ELT Stories shares some nice vocabulary activities. How many new words should you teach per lesson? is by Gianfranco Conti. Helping English Learners Build Vocabulary is by Jana Echevarria. Seven Step Vocabulary is a video from The Teaching Channel. The latest research on teaching vocabulary is from The Language Teacher Toolkit. A Game of Cards to Revise Vocabulary in a Speaking Activity. Effective, Engaging and No-Prep. is from `Blog de Cristina. Here are my slides on culturally responsive vocabulary ideas from the #OSLA19 conference. The ideas are based on @Ready4rigor's suggestion to storify, gameify, and make learning social. ==> https://t.co/kBzP2mUwzt. Word of caution: activities alone do not constitute CRT! I definitely think that by not including SpanishDict, you left out a really great resource. For native Spanish speakers, it’s a wonderful ELL site. They have Spanish translation, and other good free stuff. Good luck! Larry, a quick thank you for this list. I’m on summer hiatus but saw a couple of students yesterday who asked for vocab help. Note re word searches. I’ve never been a real fan either, and couldn’t see much value in them, but there’s evidently value for Arabic speakers! Perhaps because of the way Arabic is written, they don’t seem to “see” vowels very well in words, and THEY tell me word searches are helpful. I’m still trying to find a magic technique to teach these bright people how to read more quickly and more successfully in English. Thanks Larry, for including http://www.WordAhead.com in the list of The Best Sites Where ELL’s Can Learn Vocabulary. We have videos and flashcards for over 800 difficult English words now and its easier than ever to make your own word lists in the WordAhead Study Room. You can also follow @WordAhead on twitter or subscribe to receive a Word of the Day vocabulary video in the email. Thanks! We hope you enjoy our creations and look forward to your feedback pertaining to the same. I’d add Free Rice (http://www.freerice.com/). As well as a great vocabulary game you’re contributing to a good cause. Once you start playing you can change the level – there are 60 levels to choose from. Larry, great post! Thank you for sharing this list! I am in the process of writing an outline for a research project that focuses on teaching math vocabulary to ELLs in a small group lesson prior to the whole group math instruction. I am looking into using some of these resources as a part of that instruction, so that they can access them from home and, hopefully, continue their practice. My hope for this project is that they will begin to use the math vocabulary in class discussions and the application of that vocabulary will help with their math performance. What a resource to use for my classroom. Thank you for this… I will be excited to look more into the websites to find out which ones will be the best for my First Grade students. I am excited to use these in my classroom thank you. I also find http://www.vocabularyclub.com a good resource for learning foreign language vocabulary.